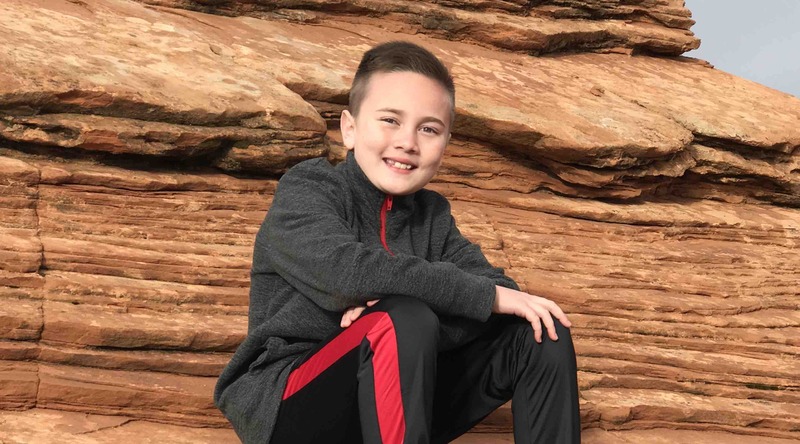 Maxton Cieslinski is a 9 year old boy from St. George, Utah. He enjoys reading, playing with his little brother, fishing, building Legos, and all things Star Wars. However, his true love is basketball. Maxton's life was forever changed Friday, January 26th, 2018, when he was diagnosed with Stargardt Disease. A straight-A student, reading at a sixth grade level while only in the third grade, Maxton began experiencing marked difficulties with his vision. Upon noticing a sudden, sharp decline in his vision (he began struggling to read even a few words on a page), and receiving similar reports from his school teacher, Maxton's parents took him to the optometrist for what they thought would result in a prescription for glasses. The optometrist could not find anything evidently wrong. After subsequent visits to the optometrist, ophthalmologist, and then to the pediatrician, who likewise could not find anything wrong with the otherwise healthy boy, Maxton was finally referred to a retinal specialist who confirmed his diagnosis. On Saturday, January 27th, 2018, less than 24 hours after being told that he was legally blind, Maxton, along with his team comprised of other third graders, played their final basketball game of the city recreation league season. Still reeling from the devastating diagnosis of the previous day and what it would mean for Maxton and his future, his parents, 5 year old brother, and members of his extended family watched in absolute awe as Maxton poured in 25 points and led his team to a resounding victory. He exhibited that day, and in each ensuing day since the diagnosis, a tenacity and determination well beyond his years. Maxton has shown that no matter what challenges we face in life, we must "never stop." We must keep trying and never give up, as miracles are possible even in less than ideal circumstances. Maxton and his family have a long road ahead in dealing with Stargardt Disease. They need all the help they can get. Even with medical insurance, the bills are piling up fast, and they have already exhausted their substantial savings over the last few weeks. There will be continual appointments with specialists and genetic testing to evaluate the cause of the disease and its implications for Maxton and his family. He has an immediate need for assistive technology to help him read again and perform other basic tasks, as assistive technology for the visually impaired can be very costly. Thank you all from the bottom of our hearts for your kind and generous donations to Maxton’s cause. Just to update you, Maxton had his first appointment this past week at the John Moran Eye Center at the University of Utah with a Physician and team who specialize in Stargardt Disease. We will be going forward with genetic testing in order to qualify Maxton to take part in research studies and clinical trials. We have also purchased polarized, protective eyewear to shield his eyes from the damaging UV rays of the sun (as sun damage can quickly accelerate degeneration of the macula with Stargardt’s).